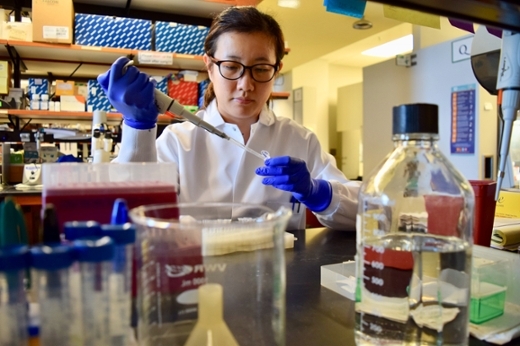 Winship Cancer Institute researcher Ruiting Lin has been investigating how dietary supplements contribute to cancer risk as well as cancer drug discovery. Ruiting Lin, PhD, a researcher at Winship Cancer Institute, received a 2018 STAT Wunderkind award on Oct. 9. The award honors 30 up-and-coming junior life scientists: postdocs, fellows and biopharma employees. STAT News is a life sciences news organization based in Boston. “She triggered my motivation,” Lin says. “I want to challenge myself to see if I could make a contribution” in the fight against cancer." Lin earned her PhD at Fudan University in Shanghai. In 2016, she was awarded the T.J. Martell Foundation’s Clive Davis Research Fellow Award, and she is currently supported by a Leukemia and Lymphoma Society career development fellowship.